The most comprehensive expose of the “pry, poke and prod” industry is likely to have broken the 1000-download threshold by the time you read this. 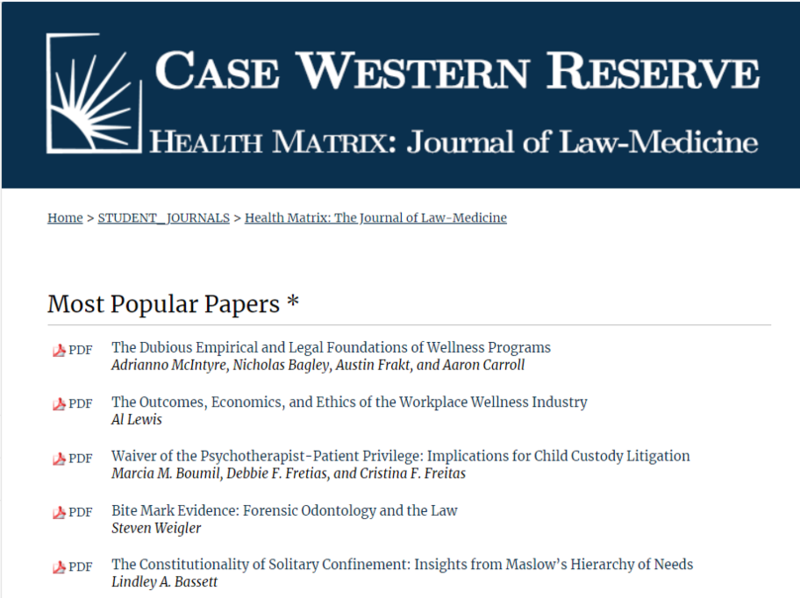 Published by the leading law-medicine journal, it is their second-most-popular paper of all time. Curiously, while this is the oldest law-medicine journal in the country and has covered a multitude of topics over many decades, the most popular paper of all time is also a smackdown of pry, poke and prod programs. Because TSW doesn’t lie (that’s part of the reason we are so unpopular amongst the HERO crowd and its sycophants), I would acknowledge that the methodology they use to measure popularity favors more recently published articles, and ours is “only” a year old. Even so it is quite a feat because, while we are close on the feels of #1, there is a big gap between us and the #3 article. In the structured world of law, as opposed to the “Wild West” of wellness, there are rules. That’s why I chose the leading law-medicine venue for this expose. One rule of evidence is that some of the best evidence — one of the few exceptions to the hearsay exclusion — is what’s known as an “admission against interest.” An admission against interest is “a statement by a party that, when uttered, is against the party’s pecuniary, proprietary, or penal interest.” It’s even more compelling if it is captured electronically, as on a live mic, or in print. The best example is Robert Durst accidentally admitting that he killed his wife during a bathroom break while being interviewed for a documentary, when he was still miked. You’d have to be, as Larry David might say, pretty pretty pretty pretty stupid to make admissions against interest when you are miked or in print. 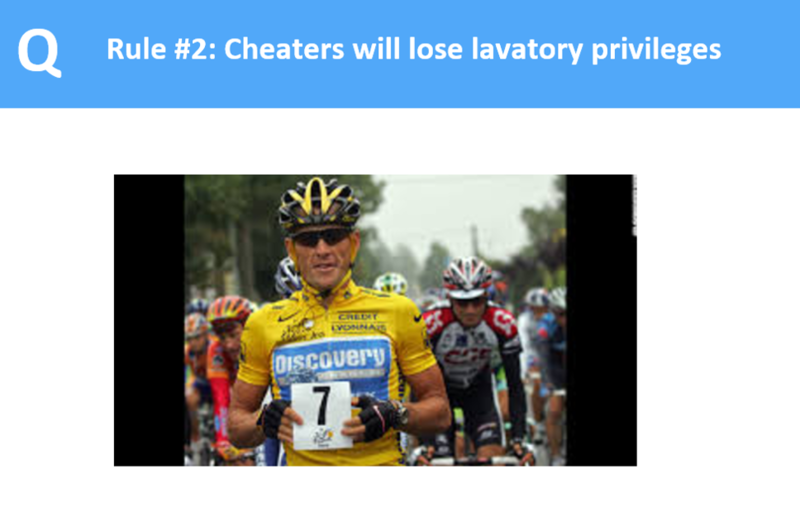 Or, as with Wellsteps, they act out with unsupported and creatively spelled recriminations. Or sometimes simply trying to erase history. This is the specialty of Ron “The Pretzel” Goetzel, twisting and turning his words to do exactly that, not realizing that we keep screenshots. Here is the “before” and “after” picture of him erasing the smoking-gun evidence that a program’s “impact” was due entirely to separation into participants-vs-non-participants rather than pry, poke and prod. Note that from 2004 to 2006, separation between participants and non-participants increased almost 20% — before there was even a program to participate in. Here is your assignment: pass this along to everyone you know and ask them to read the article. Then hopefully it will be time to write the history of wellness the way it should be written. And keep a screenshot in case Goetzel tries to rewrite it. Welcome to my world, Rex. 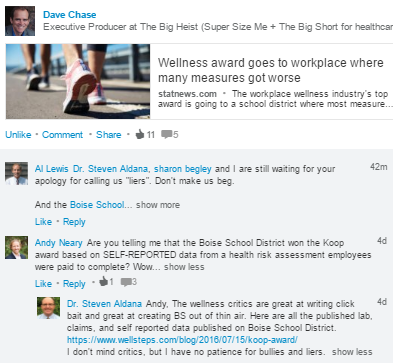 When I reached the global health and wellness director for the most cited case study, he admitted he did not know where the numbers came from or even who had actually created the report. So the result seemed to be a very high profile…urban legend. Meanwhile, back in the company of my new castaway friends, the misfit provocateurs [Tom Emerick, Soeren Mattke and me], I kept hearing simple declarative sentences and sourced data. Health indicators in 2013 and 2014 were adjusted in the analysis, while several sensitivity analyses of the ‘inter-individual’ impact that used a matching approach confirmed the results… Lewis’s conclusion essentially compares apples and oranges by mingling overall summary statistics with an interpretive analysis section that’s descriptive. The latter is based on repeated cross-sections of McKesson employees. The average weight of McKesson’s employees can’t rise and fall at the same time. As if Rex needed more data points, another red flag was being disinvited from speaking at one of the Wellness Ignorati-fests. This happens whenever a speaker subsequently admits to critical thinking after being “confirmed” to speak. Critical thinking is right up there with data, math, integrity, facts, analysis, grammar, wellness and me in the rogue’s gallery of damned spots the Wellness Ignorati attempt to wash out, out — or at a minimum pretend to ignore (hence their moniker). That’s why allowing the noses of the Rex Millers of the world (among whose unforgivable misdeeds are quoting the Al Lewises of the world in their books) into their tents might nudge their bright-eyed and bushy-tailed, painstakingly sequestered, acolytes to use the internet, perhaps searching on keywords like “Koop Award.” If they do, they might learn that in 2016, the year after the Ignorati disinformed their flock that Koop Award-winning companies dramatically outperformed the stock market, the 2015 winner became 2016’s 14th-worst performer in the S&P 500. Mr. Miller refers to the Ignorati as harboring “deep anger” about being exposed for “fabricating the data.” Rex says he “doesn’t know the intent of using false data,” but I can clue him in: false data is quite useful if you are selling a scam (the LA Times‘ word, not mine). Yes, Ron, your cordially-welcomed-but-ever-so-slightly-overdue Eureka Moment is very very very very accurate. I imagine you’ll retract it soon, because on the other occasion when you were accurate — when your guidebook accidentally admitted wellness loses money — you immediately tried to disown your findings as soon as I congratulated you on their (apparently unintentional) accuracy. The essence of Mr. Miller’s thesis is that hammering people with forced behavior change is very very very very pointless. 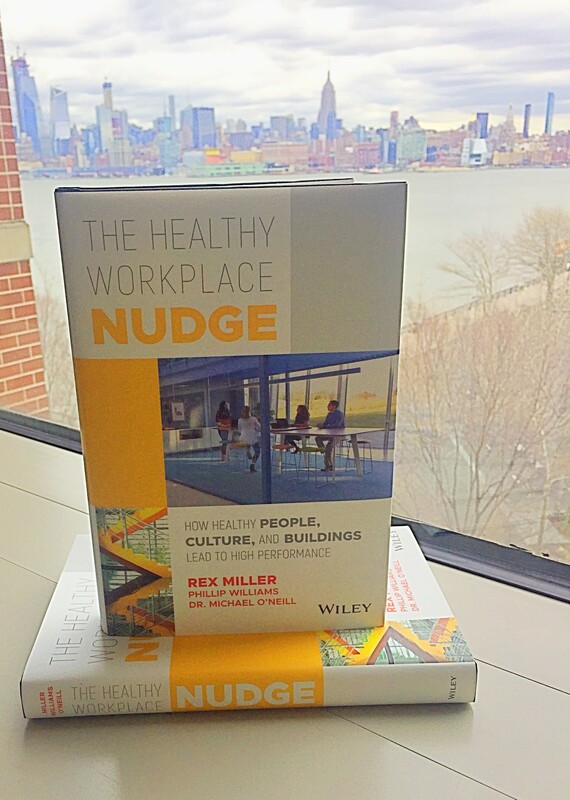 Having concluded that prying, poking and prodding employees does likely more harm than good, Rex moves on to a totally different way of doing wellness, which is to say, passively rather than actively. Clearly Rex put a lot of time and shoe leather into researching this book, and it shows. Many examples are offered of how little steps — simply moving different snacks to different places or making stairways more appealing than elevators — nudge behavior. Way beyond that, the most notable advances in this book concern the built environment. He observes we spend 90% of our lives indoors, and yet little attention is paid to the effect of indoor space on health, wellness and productivity. I suspect more attention is paid to it than he gives credit for, but certainly we have all worked in or visited stultifying workplaces, workplaces where you can’t imagine wanting to hang out in any longer than necessary. He proposes taking the built environment to the next level. Upgrading a typical building to the WELL Certification standard costs between $150 and $500/employee, all-in. 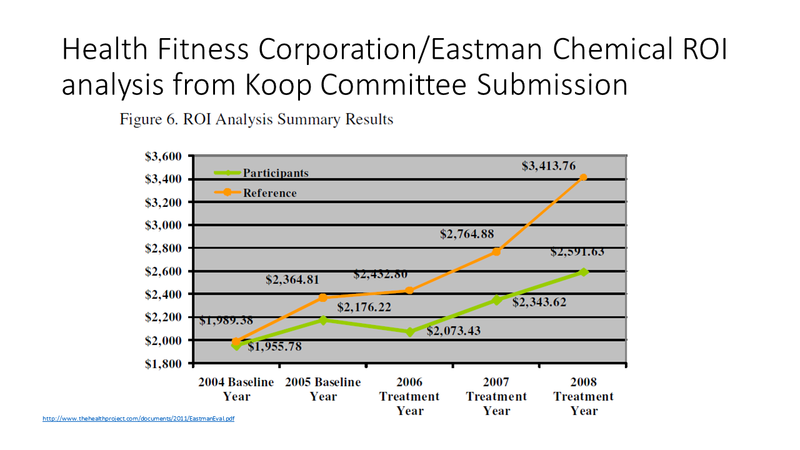 Contrast that to the math provided to him by Tom Emerick that Walmart estimated for a wellness program: accounting for all the administrative costs, false positives, and lost productivity from health fairs and “workshops” totals thousands of dollars per employee. On the “credit” side of the ledger, every pound an employee lost cost Walmart shareholders $50,000. By contrast, what goes into that $150 to $500 spent on the built environment get you? Suddenly every employee is “participating” in your wellness program, with no penalties or incentives needed. Not just the food in the cafeteria, but everything down to the air that circulates can be optimized for health and performance. “At their best,” he concludes, “buildings can be inspiring and invigorating–with little additional expense.” For instance, office and factory interiors tend to be dry, which facilitates the spread of disease. They also often allow in little natural light, the lack of which can disrupt circadian rhythms. Both can be easily remedied, with humidification, and with lighting that mimics our circadian rhythms. The beauty of his proposal on the built environment is that, unlike traditional wellness programs where even the promoters say you need to do everything right to get them to work (“Only 100 or so programs succeed, while thousands of programs fail,” according to Mr. Goetzel), you can solve this problem by throwing money at it…and not much at that. Mr. Miller does go on to point out the value of leadership, but I prefer solutions that anyone can implement, as opposed to solutions that require CEO behavior change, which is very very very very hard. In conclusion, go to Amazon and buy this book. Do it very very very very soon. Plus, the more copies he sells, the more Ron Goetzel will get very very very very mad. That’s two moles whacked in just one paragraph. Then when the productivity thing didn’t pan out, they invented something called value-on-investment, which (even though they invented it specifically to show savings) turned out to show massive losses on even the most cursory examination. Third mole. Bottom line: all their studies that do actually exist self-invalidate no matter what they claim because — get ready — wellness loses money. Now it looks like there is a fourth mole to whack — Mr. Goetzel’s latest charade is, yeah, maybe virtually all studies in existence reveal losses upon examination, but that studies that don’t actually exist show massive savings. Perhaps he was inspired by Wellnet, which shows massive savings in “undetected claims cost,” which also don’t exist. Google on “undetected claims costs.” The only hits you get are Wellnet and me making fun of Wellnet. I was recently forwarded an email containing Ron’s latest musings. I’ve never met the originator of the email, so he could have fabricated the entire thing for all I know. But in terms of credibility, if Ron Goetzel tells me the sky is blue and someone I’ve never met tells me the sky is green, I’d at least go look out the window. in the case of Penn State, goaded them into creating a wellness program that became a national punchline. The latter would be quite impressive if they do — except that they don’t. I’m not naming them to protect their privacy, but suffice it to say I sent them both the snippet of that email with their names in it, and they got a kick out of it. (“I never, ever, thought this nonsense worked.”) I added that if Ron Goetzel went around bragging that I paid him $250,000 to analyze my numbers, I’d sue for defamation. On the flip side, he is also telling people (privately, so that I don’t find out about it like this) that I am [blushing] “the least credible person in the industry,” perhaps having forgotten that he had already accidentally admitted that I am the most credible person in the industry. I’m in good company — he also disses the second-most-credible evaluator in the field, for the simple transgression of publishing a high-quality study that showed losses that Ron inadvertently validated, before trying to pretzel his way back from with a series of lies that would make a White House press secretary blush. He would also have to explain why, if I am so non-credible, he begged to be on the advisory board of the Validation Institute (which I started with Intel-GE Care Innovations). We couldn’t have him on the board because the whole point of the Validation Institute was to be credible, which it is. It is now the official validator for the World Health Care Congress. He even got David Nash to try to strongarm us. We could have just said no, but what fun would that have been? We said: “Sure, you just have to be certified in Advanced Critical Outcomes Report Analysis first.” The test at the time consisted of finding all the errors in his Nebraska analysis, so he couldn’t earn the CORA certification without admitting that all the claims in the study were fabricated, impossible, or represented industry-leading ignorance of the way prevention works. For example, the very stable Nebraska geniuses “waive[d] all age-related screening guidelines” so that young people could get screens intended only for older people, which would be like “waiving” the minimum age for getting a driver’s license to get more young drivers on the road. The point-to-point change is -.3% in the non-exposed population (orange) vs. +.1% in the exposed population (blue). The difference of differences should be going in the opposite direction, since essentially every known major factor that could impact this blue line more than the orange line is held constant, other than an increasing penetration of workplace wellness into the blue-line population. 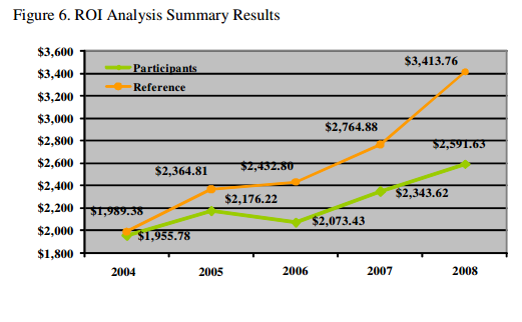 Spending about $6 billion more on wellness services in 2014 (vs. 2001) should have made a huge favorable impact on the blue line, given that the total spent on inpatient wellness-sensitive medical events in 2014 was roughly $7 billion, applying the Health Enhancement Research Organization’s estimate of $25,000/admission to the 285,000 relevant 2014 admissions. It’s actually worse. 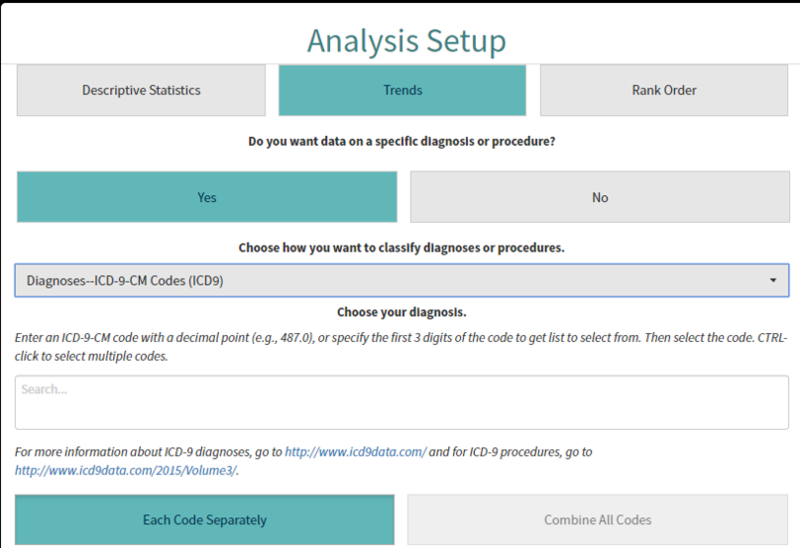 Only about half the employed population has access to screening and risk assessments, meaning that the size of the industry overwhelms the size of the addressable events even if one assumes that all the diagnoses leading to the events were found in screenings. It might seem absurd to assert that the wellness industry in total (almost $8 billion today) is double the size of the healthcare spending it is supposed to address, but a “bottoms-up” analysis gives the same answer: In the privately insured population, 4.1% of admissions were wellness-sensitive in 2014. Figure half these events take place in people who already know they are at risk or have the diagnosis. So 2% of all admissions involved employees who did not know they had the diagnosis when they had the event — and hence could conceivably have learned about it and avoided it through a wellness program. Admissions are about half of all costs, meaning 2% of admissions would consume 1% of costs. 1% of a typical $6000/individual employee spend is $60/employee/year. 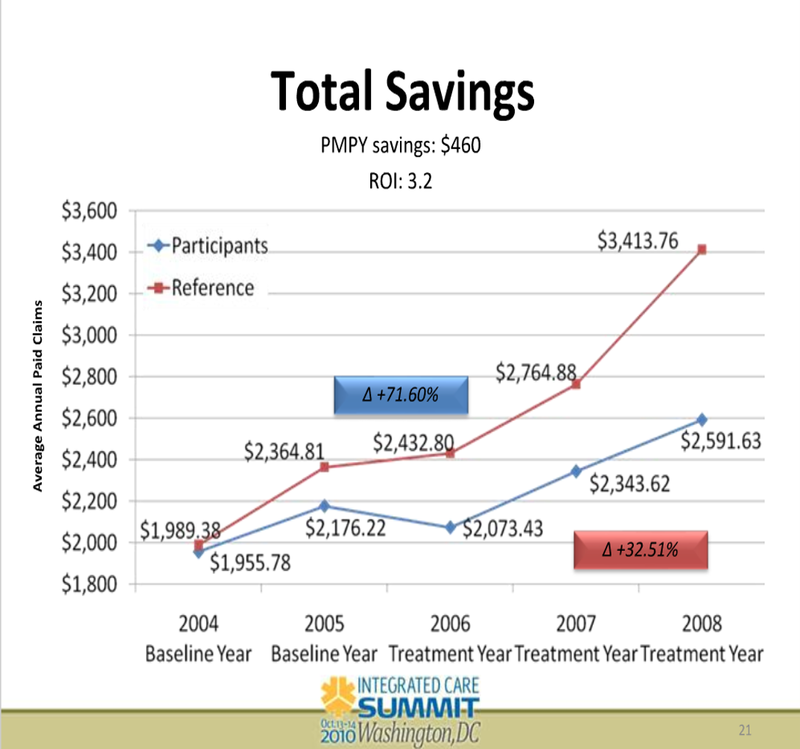 A wellness program, including the screening, likely costs $150. That means even a perfect program — one that finds every employee with a hidden diagnosis, avoids all false positives, and prevents every event without any added cost of prevention therapy– would lose money. Alas, as lovingly documented on this website through the years, a beam of light leaving “perfect” wouldn’t reach the “pry, poke and prod” industry for several seconds. The fairly dramatic upswing starting in events in the exposed population (the blue line) starting in 2012, even as the rest of the country was almost leveling off, correlates quite closely with the move towards health-contingent, or “outcomes-based” wellness, in which employees who don’t crash-diet hard enough before the final weigh-in get fined. So while a study by Redbrick showed no benefit to health-contingent programs, the truth is likely worse: many health-contingent programs actually do harm, as Interactive Health recently demonstrated and for which Wellsteps won a “best-in-industry” award. Much is this harm is visited upon employees with eating disorders. You can ask me for the raw data, and/or replicate this exact analysis, using ingredients you already have in your kitchen — an internet connection (which perhaps even Bravo has acquired by now) and the links below. Doing this by payer is critical. Almost every employee with access to workplace wellness will be commercially insured — or as HCUP puts it, privately insured. It will give you all the admissions, by payer, for all the years. You are then given an option to drop this into Excel, an option you should take. (This is the definition of “voluntary,” by the way. Your employer won’t fine you if you don’t.) Once it is in Excel, you can copy-and-paste the actual year-by-year data into an easy-to-use format, like this little snippet that lists stroke-hypertension and then repeats the format for all admissions:”All admissions” becomes the denominator for those 15 years, split into “private insurance” (where over those 15 years members had gained increasing access to wellness programs) vs. the other five categories combined, which did not have wellness access. After you complete this analysis, you will find that the reason I offered a $3 million reward to show wellness saves money is because there is no chance of anyone ever being able to claim it. The wellness industry’s terrible, horrible, no-good, very bad year just got worse. February 27, 2018 6:35 pm / 2 Comments on The wellness industry’s terrible, horrible, no-good, very bad year just got worse. The Wellness Industry’s Terrible, Horrible, No-Good, Very Bad Year just got worse. Seems like CMS (Medicare) and Modern Healthcare are also ganging up on the Health Enhancement Research Organization (HERO) and all their cronies. Utiization and expenditures actually increased among program participants… The results mirror those in the corporate world. 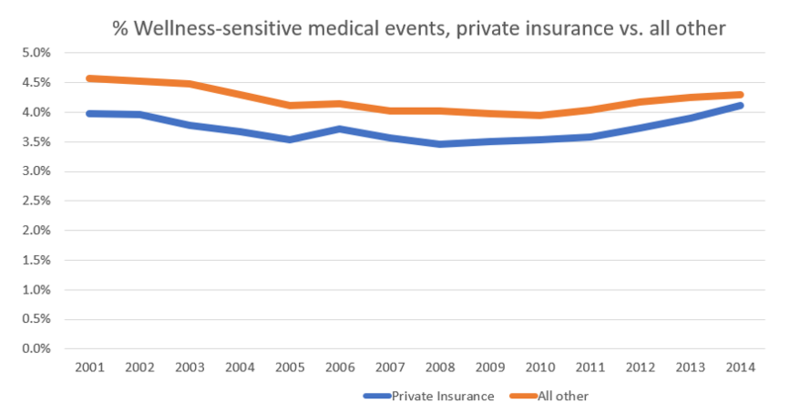 So, while it didn’t reduce healthcare expense or utilization, it seems to have had a positive impact…by preventing or delaying normal deterioration that comes with age. Where Mr. Wojcik came up with this spin, creative even by wellness industry standards, is anyone’s guess. Nothing in the program suggests it and when he finds something that does prevent age-related decline, I will be the first to nominate him for a Nobel Prize. The curious thing is this failed approach is not “wellness or else” as Jon Robison calls it. Instead these programs are truly voluntary. Also unlike corporate wellness programs, vendors aren’t harassing healthy employees to eat more broccoli but rather focusing on unhealthy ones. Instead of making healthy 30-year-olds get unneeded checkups, they’re encouraging 70-year-olds with chronic disease to get more medical care. And yet the programs still don’t work. Color me surprised. I genuinely thought (and I honestly still think) that willing participants in voluntary programs who have chronic disease would benefit from these programs. Perhaps when they re-review another year’s data they will find a benefit. Alternatively, instead of trying to maintain the revenue streams of their members, perhaps HERO could actually try to find a new model that does provide a benefit. Certainly there are plenty of vendors out there with possibly better mousetraps, but they all have one thing in common: they have no use for HERO’s pet vendors, any more than companies that make solar panels have a use for coal. Teddy Roosevelt said, “complaining about a problem without posing a solution is called whining.” It’s a quote that also reminds me why I’ve not thought of angry bloggers who target health promotion [vendors] as bullies. Though they relish trolling for bad apples, their scolding is toothless, more the stuff of chronic whiners. We’re fortunate to work in a profession with a scant number of vociferous critics. My take is that there is one thing these few angry loners want more desperately than attention: that’s to be taken seriously. Just like wellness vendors like to define “voluntary” as “forced,” I guess in wellness-speak “scant number of vociferous critics and chronic whiners” mean “every commentator,” and an “angry blogger” is any blogger with a great big smile on his face. OK, this time I’m not the one causing the kerfluffle in the wellness industry, though I will confess to being a force multiplier. Not since 2014, when the very unstable morons at the Incidental Economist made fun of the very stable geniuses who give out the Koop Award and also unequivocally concluded wellness loses money — combined with continued fallout from the Penn State debacle and the Nebraska scandal — has the wellness industry had such a bad year. And it’s only February. Next, WillisTowersWatson did something that might get them in hot water with the very stable wellness industry leaders: they were honest. They published a study revealing that employees hate wellness even more — way more — than they hate waiting for the cable guy to show up. Finally, the very unstable National Bureau of Economic Research conducted a controlled study finding basically no impact whatsoever of a wellness program. More importantly, they specifically invalidated the “pre-post” methodology. Even more importantly, they specifically invalidated 78% of the studies used in Kate Baicker’s “Harvard Study” meta-analysis. Here is an interesting piece of trivia. The lead researcher is an assistant professor at the Harris School of Public Policy. Why is this interesting trivia? Because Katherine Baicker — the Typhoid Mary of Wellness, whose THC-infused 3.27-to-1 ROI is the basis for essentially every subsequent genius wellness outcomes claim — is now the dean of that very same Harris School. I’m just guessing here, but I’d say it’s gotta be a trifle embarrassing when your own subordinate publicly disproves your own study. I mean, it’s one thing for me, RAND, Bloomberg, and anyone else with five minutes, internet access and a calculator to do it, but…your very subordinate? On the other hand, the researcher, Damon Jones, just demonstrated not just amazing competence, but amazing integrity as well. In other words, he has no future in wellness. How does the wellness industry respond to these smoking guns threatening their entire revenue stream? 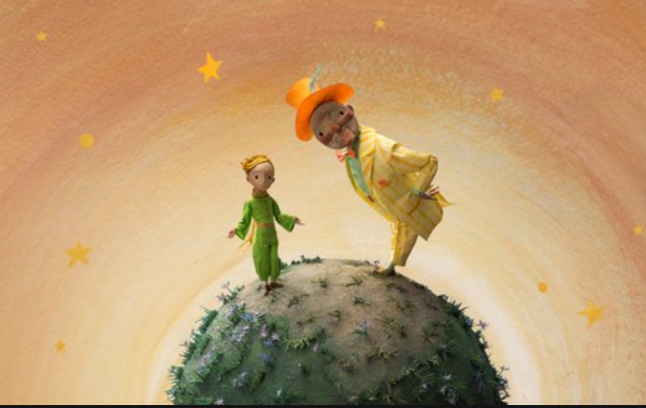 Apparently, there is little cause for concern on their planet. Offering incentives for completing wellness activities might be more cost-effective than offering incentives for wellness screening, a recent study of a comprehensive program found. We…do not find any effect of treatment on the number of visits to campus gym facilities or on the probability of participating in a popular annual community running event, two health behaviors that are relatively simple for a motivated employee to change over the course of one year. Wellness programs might attract mostly employees who are already fitness-conscious, but the potential to attract healthy employees whose medical spending is already low could nonetheless be a boon to employers, the researchers found. We further find that selection into wellness programs is associated with both lower average spending and healthier behaviors prior to the beginning of the study. Thus, one motivation for a firm to adopt a wellness program is its potential to screen for workers with low medical spending. Considering only health care costs, reducing the share of non-participating (high-spending) employees by just 4.5 percentage points would suffice to cover the costs of our wellness program intervention. In other words, you can apply some workplace eugenics to your company by using wellness to weed out obese employees, employees with chronic or congenital diseases, and so on. Good for you! Soon, if AHIP and others have their way, there will be no need for guesswork in eugenics: employer wellness programs will be able to screen these employees out based on their actual DNA. Here are more typical headlines on that court ruling, headlines that came out the same month that the court ruling came out. Perhaps AHIP used the interim six weeks to focus-group various verbs until they settled on…tweak??? I just returned from one of the dumbest meetings I’ve ever attended in Washington. Report of a new “study” by AHIP. Turns out people don’t mind health costs all that much, they just want more benefits. And everything is hunky-dory with their health plans, people like them so much. They love wellness benefits and crave more. Prescription drug prices have been nicely controlled thanks to the competitive marketplace (no, I am not making this up or exaggerating for drama). For every $1 employers spend on benefits workers get $4 in value. Priorities for SHRM rep: Fitbits for all employees, solving the outrage that only 20% of her employees got an annual physical. 85 cents of every dollar spent on health care goes to chronic disease. Over these same two hours, I’d estimate about a thousand employees were misinformed, harmed or harassed by wellness vendors, roughly equal numbers of employees got useless annual checkups, employers spent about $200-million on healthcare and 40 people died in hospitals from preventable errors. But I’m being such a Debbie Downer! I’m going home to read Why Nobody Believes the Numbers to remove myself from this alternative universe. HERO’s Prevaricator-in-Chief, Paul Terry, is demonstrating his usual leadership abilities in this crisis, of course. 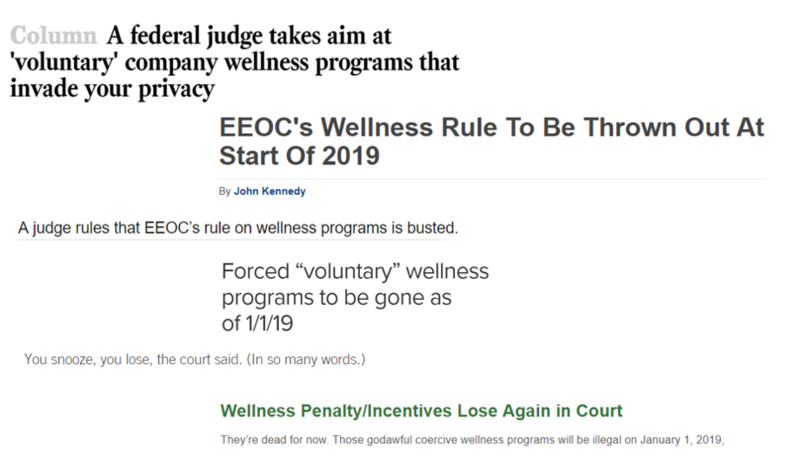 After all, HERO is the wellness industry trade association and these three items — the NBER invalidating their product, employees hating their product, and a federal judge forbidding them to force employees to use their product — represent existential threats to his “pry, poke and prod” members. I suspect he is talking about me here as the “chronic whiner” who is “scolding” them. Or perhaps he is referring to the “angry bloggers” at the Los Angeles Times, the New York Times, Slate, or STATNews, since those “toothless” publications seem to be scolding wellness vendors more than I ever have. For instance, I’ve never called wellness vendors’ offering a “scam” or a “sham.” I simply quote these very stable wellness geniuses verbatim, as above or below, or last week. Why I choose to ignore the blogger critics: We’re fortunate to work in a profession with a scant number of vociferous critics. My take is that there is one thing these few angry loners [Editor’s note: the complete “scant list” of the 220 “few angry loners” who have been “vociferous critics” can be found here] want more desperately than attention: that’s to be taken seriously. What they fail to comprehend is that as they’ve gotten ever more farfetched and vitriolic in search of the former, they’ve cinched their inability to attain the latter. Baiting people with misinformation and offensive insults (but just a tad under highly offensive) is a pesky ploy that trolls hope will eventually land a bite that confers credibility where there is none. Even reading such drivel is a form of taking the bait; responding is swallowing it whole. Some say dishonesty should not go unchallenged and I respect their view; nevertheless, I’m convinced responding to bloggers who show disdain for our field is an utter waste of time. I’ve rarely been persuaded to respond to bloggers, and each time I did it affirmed my worry that, more than a waste, it’s counter-productive. Having read years of my “drivel” alongside Mr. Terry’s posting explaining why you shouldn’t “swallow this bait,” perhaps readers might opine here: which of us, exactly, is the “chronic whiner”? 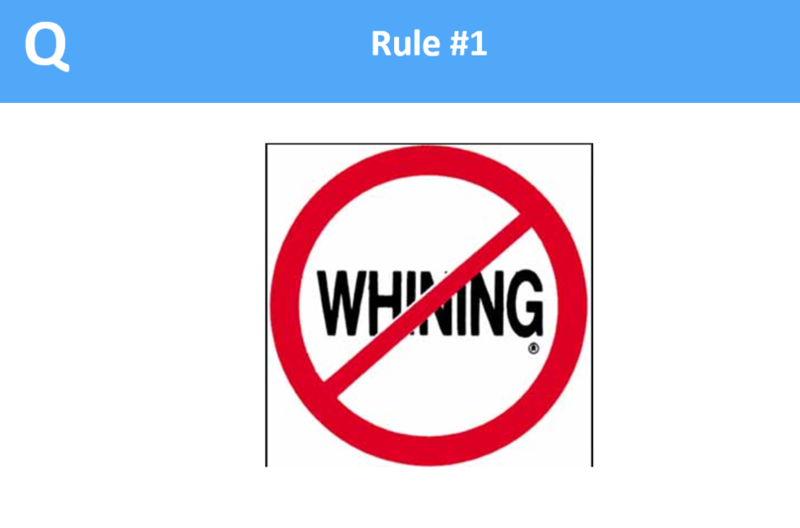 Coincidentally, when I run live health-and-wellness trivia contests, the first of our 3 rules is: No Whining. Seems to me that he would have just violated it. 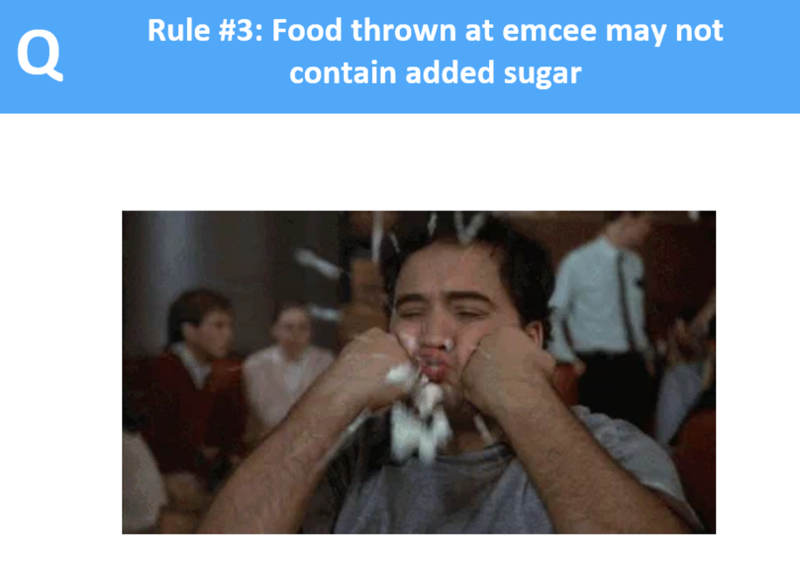 Indeed the only rule HERO hasn’t violated so far is #3 below. Not that I want to put ideas in their head.